In honor of National Pizza Day, the pancake chain is rolling out something big. Ever find yourself being forced to decide between ordering a pizza or pancakes? If so, fret no more. For just one day in February, IHOP (formerly IHOb) has two of mankind's most extreme food cravings covered. Say hello to the new “Pancizza” — a hybrid food we're not quite sure anyone asked for ... but it's coming anyway. Like a pizza, the larger-than-average pancake comes in a square box. And though it’s fluffy and round, it's not quite like the traditional breakfast item. The pancizza (it's pronounced “pan-keet-za”) will hit a few U.S. cities on Feb. 9, which is also National Pizza Day. IHOP already celebrates National Pancake Day annually in March, but for some reason decided to also make its mark on Pizza Day by presenting this “never-seen-before food innovation." The pancake-pizza is essentially a 7-inch pancake that comes in a custom pizza box. You can choose between Original Buttermilk, Sweet Cupcake, and Bacon and Cheddar, and there are savory toppings, like cheese and bacon. The first option is just a huge pancake with a scoop of butter on top; the Sweet Cupcake-themed Pancizza has an icing spread, a whipped cream topping and colorful sprinkles all over it. The Bacon and Cheese option comes with melted cheddar cheese and bits of crumbled bacon sprinkled on top. Of course, like many of IHOP's viral promotions, there's a bit of catch depending on where you live. 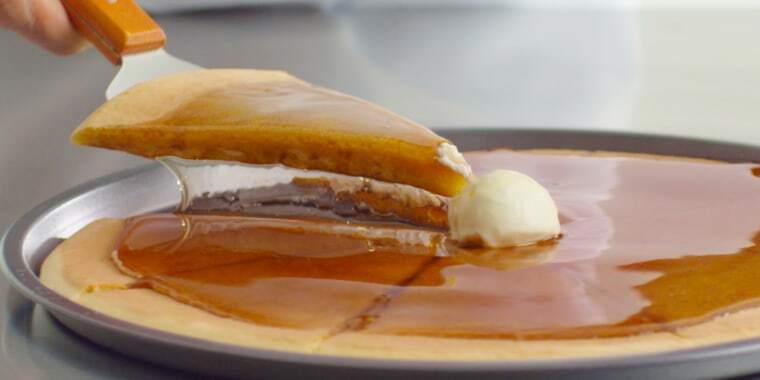 If you live in New York City, check out IHOP's takeover of the legendary pizzeria, Bleecker Street Pizza, which will be transformed into a "Pancizzeria Shop" on Saturday. Show up between 11 a.m. and 11 p.m. to get a free pancake-pizza slice. For those who can’t make it to this pancizza parlor, IHOP is offering delivery. The restaurant partnered with DoorDash to bring pancizzas from select restaurants in the Chicago, Dallas, New York City and Los Angeles areas right to your door from Feb. 8-10. Each pancizza costs $4.99 and comes with a variety of signature IHOP syrups. However, the new item will be available only at 100 restaurants across the country. And if you prefer your pizza the usual way — with a real crust, sauce, cheese and savory toppings — there are plenty of other ways to score big on National Pizza Day deals on Feb. 9.